The In-Page Lightbox shows up in your browser. The In-Page Lightbox is fully responsive and can be set to any width. Note: The In-Page Lightbox doesn’t support full-width images, but if you want to enable that feature you can always use the Pop-Up Lightbox instead. Read below to see more in-depth explanations of some of the In-Page's Lightbox features. 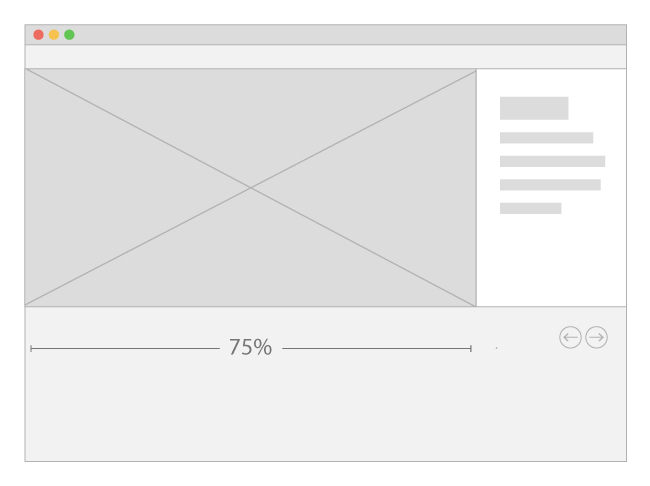 Here you can specify the % of width that the slider image will take up when it's opened. 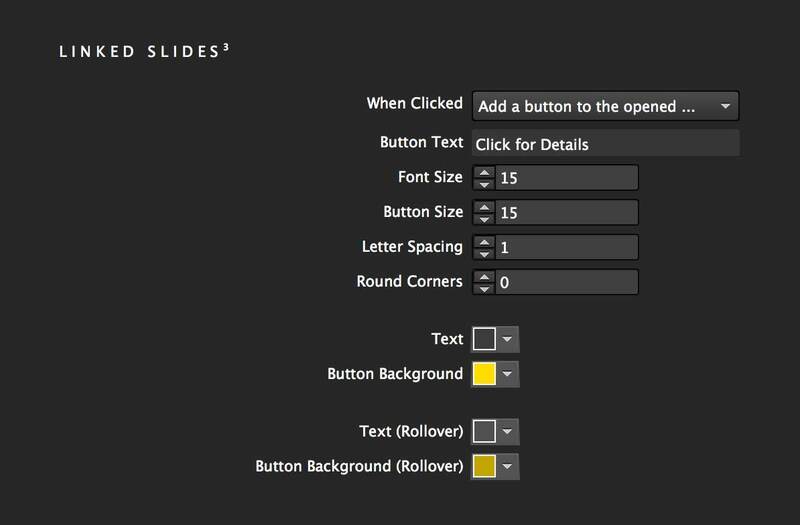 For example, if you enter 75, when you click on a slide, the image will always be 75% of the slider's width. Here you can specify the maximum-height that the slider image will take up when it’s opened. Specify the amount of time that it takes a slide to open/close. Checking this box will move the slider to the top of the browser when a slide is clicked. When you create a slide, you have the option of adding a link to each slide. In this section, you can manage how slides handle links. You can also customize the appearance of buttons. When you click on a slide, you can choose to ‘Open the Link Directly’ or you can ‘Add a Button to the Opened Slide’. If you choose ‘add a button...’ the button will show up below any description that you put on a slide. You can customize the button with the options below. Text that appears on the buttons for linked slides. Font size of the text on the buttons. Specify the radius of the button corners. 0 will create a rectangular button; 100 will create a rounded rectangle button. You can choose between four different positions for the close button. You can choose to have your close button circle or square shaped. Go to the main options and change the lightbox type to pop-up. Open the 'Lightbox [Pop-Up]' tab. Customize the colors and opacities as desired. 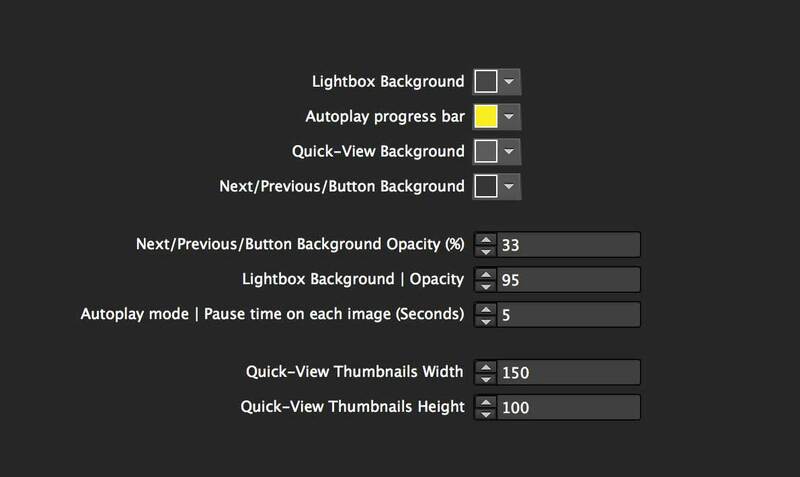 Once you're done customizing, go back to the main options and change the lightbox type back to in-page.